Just over the railway bridge, which is next door to Mitchelton Pre-Schooling Centre (MPC), there is a wonderful open space. Evidence –based research highlights the value of connecting children with nature and community. MPC is in an urban space with wonderful trees but because of these trees we are unable to grow grass everywhere. The Bush Park has space for running and exploring where children are filled with a wonderful sense of freedom and endless possibilities. Taking children for local walks is aligned with early childhood frameworks and MPC philosophy. In relation to children we support children’s exploration of the natural world and foster their understanding of sustainable practices. We recognise that children are living in a rapidly changing world. Listening, negotiating, compromising, sharing, respecting selves and others, risk taking, problem solving and resilience are key dispositions and skills for life. We trust in children’s capacity to observe, explore, question, investigate, create, wonder and experience. We recognise the traditional owners of this land. Each space, both MPC and the Bush Park, builds potential for the other. 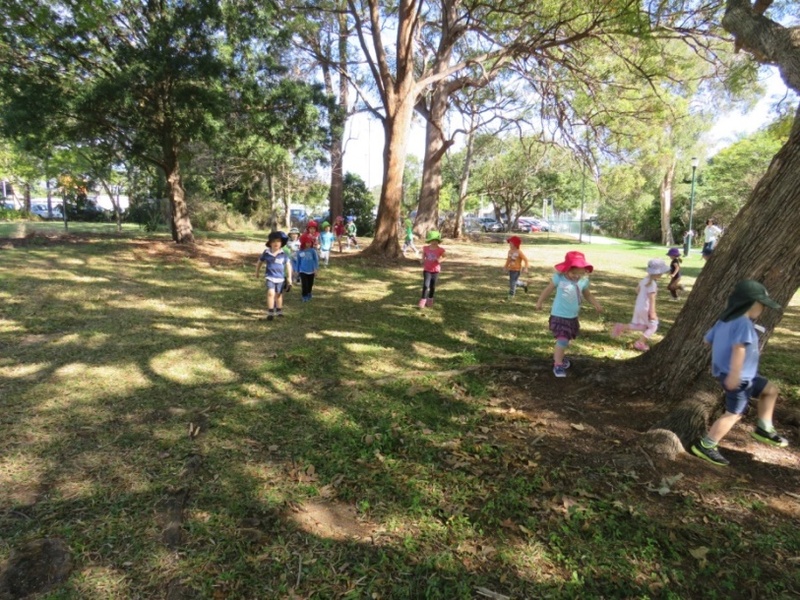 Children go to the park with the same ‘atmosphere of learning’ as MPC. They are afforded opportunities to develop dispositions and skills to support life-long learning – independence, resilience, risk-assessing and willingness to have-a-go, perseverance, problem-solving, self-regulation, listening, creativity and the like. We’ve noticed how each space builds potential for the other. At MPC children are building confidence and appreciation so when they’re at the park, particularly after a number of visits, they are more likely to slow down, look for detail and take note of what is around them AND children love it! How much time does your child spend outside?